Photo from US Embassy Afghanistan The top UN official in Afghanistan admits fraud tainted the election. UNAMA head of mission Kai Eide says fraudulent votes were cast but denies claims by former deputy, Peter Galbraith of attempted cover-up. Public and international faith in the election plunged to at an all time low after the fraud allegations and the UN attempted to bolster credibility in the process today by surrounding Eide with leading ambassadors at the stage-managed press event. Eide said their presence was a "sign of international support" for his approach. Galbraith had claimed that his former boss failed to stop polling stations from opening in areas that were too dangerous for monitors to visit. Western diplomats are anxious to shore up support for the poll as the Election Complaints Commission, a watchdog led by non-Afghan staff, prepares to unveil the results of an investigation it ordered into electoral fraud. Around 10% of the 3,498 ballot boxes regarded as suspicious have been inspected by election staff looking for signs of irregularities. Jean MacKenzie of Global Post writes about the over 400 ballot boxes quarantined by the IEC (Independent Election Commission): “The problem was that the results were being dribbled out in 10 percent increments, and Karzai, while edging ever closer to the magic 50-percent-plus-one threshold, had not yet cleared it. The president was getting impatient, and the IEC was prepared to push him over the top with their next announcement. But discounting the votes from the 400-plus boxes would keep him under 50 percent. 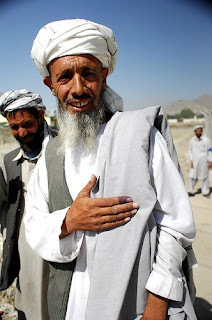 So, magically, they “unquarantined” the offending ballots.” More here on respecting the process in the Afghan elections. "The United States fully supports United Nations Assistance Mission in Afghanistan (UNAMA) and Special Representative Kai Eide in UNAMA's oversight of and support for Afghanistan's election processes on behalf of the world community. We are in close cooperation with UNAMA and Ambassador Eide, and believe that the agency and its leadership have shown sound judgment in the conduct of their mission." Does that mean that the guy they kicked out had not? --- shown sound judgment, that is? Peter Galbraith, by the way, has just written a new piece appearing in time.com entitled "How the Afghan Election Was Rigged." This democracy business is complicated, isn't it? You spend $300 million on elections in a country eaten raw by corruption, divert significant resources from the counter-insurgency effort to nudge democracy off its feet and all you get is what? This. As good old Mal would say, "Holy Testicle Tuesday!"